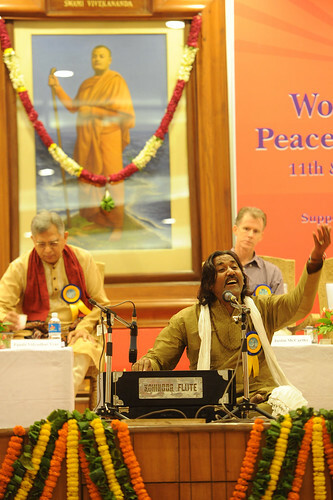 We are very glad to inform you that the World meet for Peace and Harmony held at our centre on the 11th and 12th of September, 2012 was a soul-satisfying event of extraordinary proportions. We had begun the preparations in right earnest months ahead of the Meet. 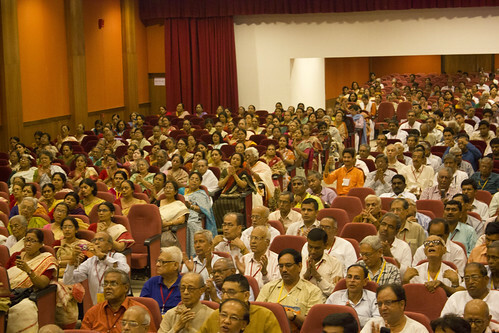 We had provided first-class air-conditioned accommodation for about 1,250 delegates i.e. 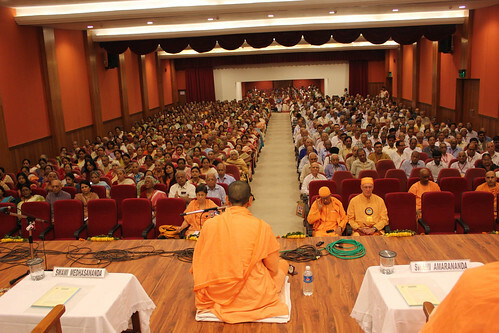 700 in the newly renovated and air-conditioned Vivekananda Auditorium and 550 in the air-conditioned pandal put up in one of the lawns in front of the temple. We had also put up a weather proof pandal for distribution of food. Through a huge LED Wall all the programmes in the auditorium were telecast live in the pandal below. The Meet started with an All Faiths Prayer in our Universal Temple of Sri Ramakrishna in the presence of His Holiness the Dalai Lama and all the invited speakers from different parts of the world. At the end of the prayers by the representatives of different religions, His Holiness the Dalai Lama gave his benedictory address. After this the Dalai Lama inaugurated our new permanent exhibition on Swami Vivekananda designed and developed by the National Council of Science Museums. This was followed by the inaugural session which began with a beautiful song by the children of our Sarada Children’s Forum. 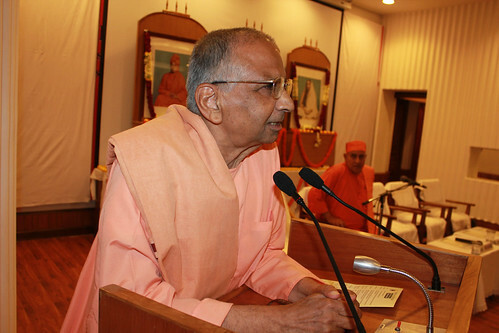 After the welcome address by the Secretary, Swami Shantatmananda, Revered Swami Vagishanandaji Maharaj, who was the Guest of Honour in the inaugural session, gave his address. 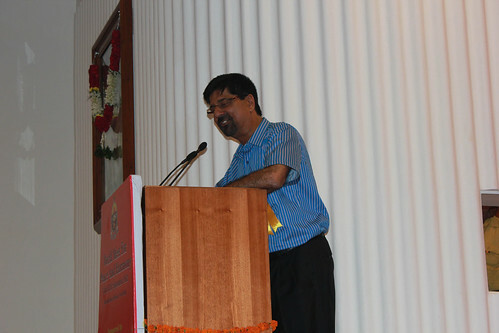 This was followed by a thought provoking speech by Dr. A.P.J. Abdul Kalam. Finally, His Holiness the Dalai Lama gave his message of peace and harmony. On the first day i.e. 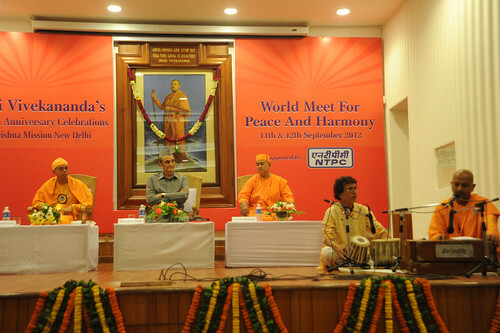 on the 11th of September the other two sessions were devoted to the theme of Peace and Harmony from religious perspective in which several international speakers presented their points of view. 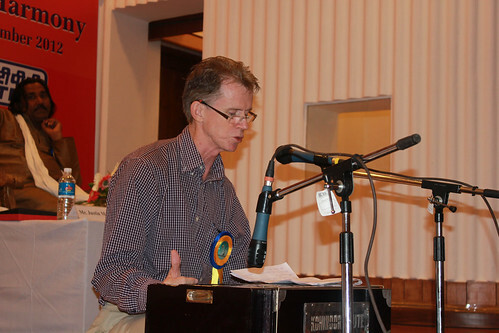 There were representatives from Christianity, Islam, Hinduism, Judaism, Buddhism and Jainism. On the 12th, the day began with a soul-stirring presentation by the representatives of two museums of peace, one located in Taipei, Taiwan and the other in Los Angeles, USA. 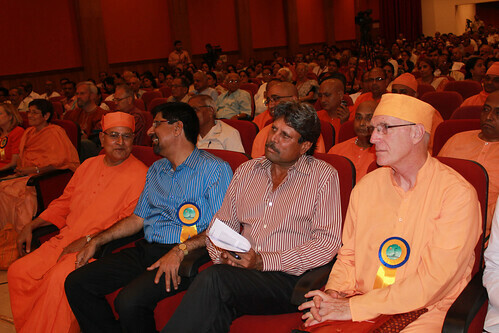 The presentations touched the hearts of the viewers. 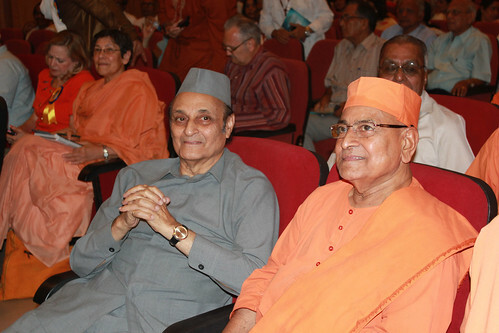 After this Revered Swami Suhitanandaji Maharaj, General Secretary, Ramakrishna Math and Ramakrishna Mission, inaugurated the new 3D Theater and a 3D Realistic Stereoscopic animation film on Swami Vivekananda. Incidentally, it is one of the rarest instances where a realistic 3D film has been produced only using photographs (Swamiji’s). Even in the West, for 3D films they produce, they use live characters. 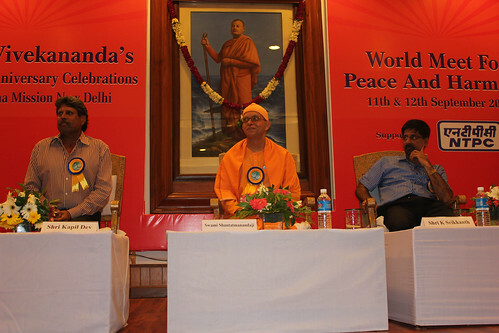 This was followed by a special session on the Contribution of Ramakrishna Movement for Peace and Harmony. 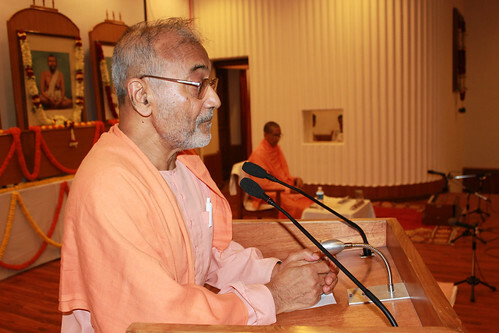 It was chaired by Revered Swami Gautamanandaji Maharaj in which our Swamis from Switzerland, South Africa, Japan, Singapore, America and India presented their views. 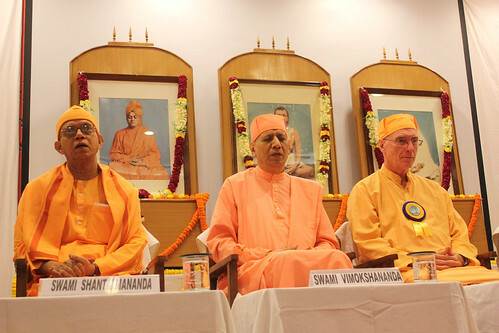 The next session was devoted to the contribution of Science towards Peace and Harmony which was chaired by Swami Atmapriyanandaji and two other eminent scientists presented their views. 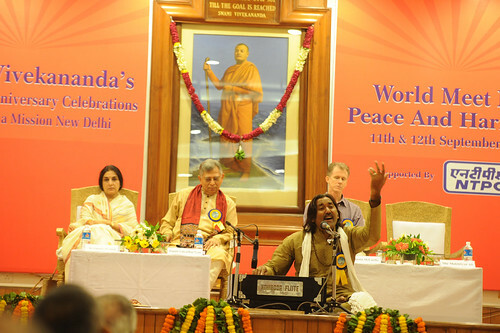 The next session was dedicated to the Contribution of Music towards Peace and Harmony in which musicians belonging to the traditions of Western music, Sufi music, Gurbani music and Hindustani music presented their views on peace and harmony along with glimpses of their musical talents. 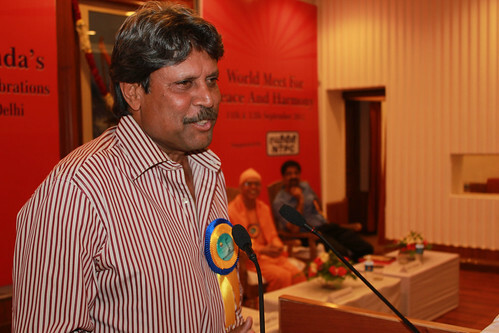 The final session was dedicated to the Contribution of Sports towards Peace and Harmony in which Shri Kapil Dev and Shri Krishnamachari Srikkanth, former cricketers who had represented our country with distinction, spoke. 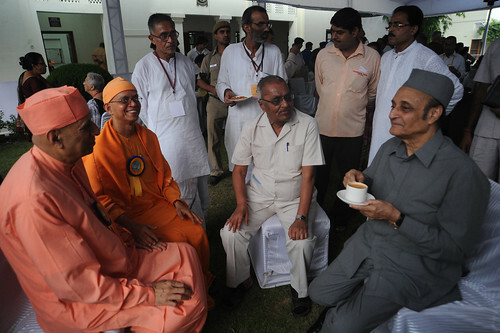 The valedictory session which followed this was chaired by Dr. Karan Singh. 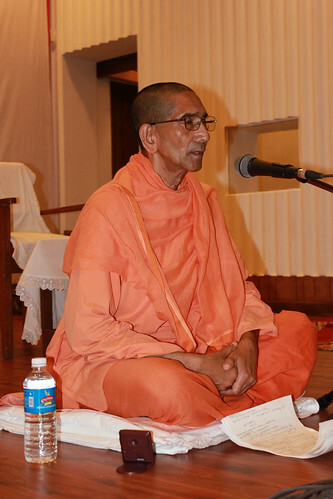 The Meet came to a close with a song by Swami Swatmaramananda. The Meet received wide appreciation and was well attended with nearly 1,300 people being present on the first day. 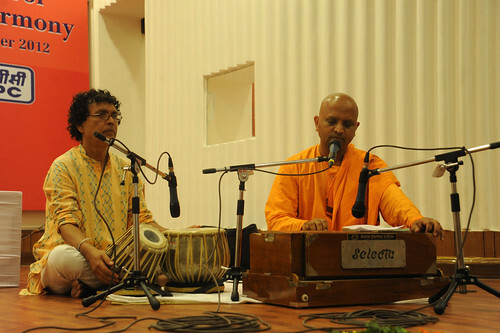 It received wide coverage with several newspapers and TV channels reporting the event. 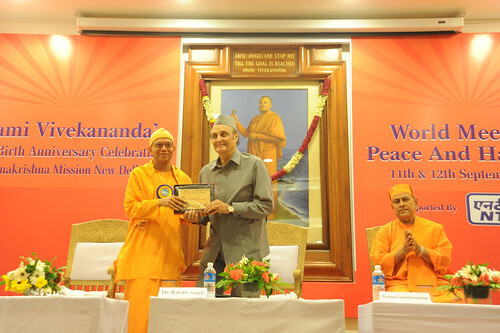 Sri Sankara TV directly telecast some of the sessions. Arrangements had also been made for live webcast of the programme. 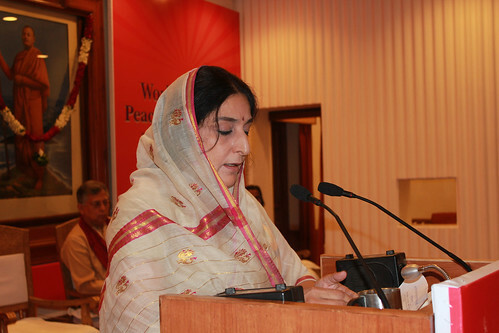 The speakers numbering 30, who had come from different parts of the globe as well as India, and the delegates and other invited guests were deeply appreciative of the entire Meet, both about the arrangements as well as the contents i.e. the actual programme. 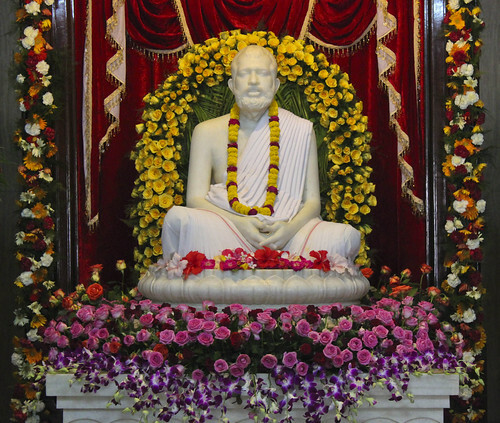 All this was possible through the boundless grace of Sri Sri Thakur, Ma and Swamiji.